It’s the day before Thanksgiving, and while the rest of us are worrying about what time we should start roasting our turkeys, Paul O’Neill has a different set of concerns: The 18 semis and 16 tour busses that are transporting his Trans-Siberian Orchestra spectacles across America. In seven years, Trans-Siberian Orchestra has not only become the holiday season’s main concert attraction, but also one of the year’s top ticket-sellers. And they accomplish this in less than six weeks on the road, splitting their ensemble into two equally impressive and awe-inspiring bands, each of which is responsible for performing in front of a different half of America in the final weeks of each year. Sound confusing? Try spearheading the whole operation, which O’Neill has done since he conceived the idea that would become the band’s now multi-platinum debut, Christmas Eve And Other Stories, nearly a decade ago. Yet in the face of it all, he remains as calm and composed as a freshly fallen Christmas snow. To that end, the sky’s the limit for Trans-Siberian Orchestra, and O’Neill is sure to spare no expense when assembling a show that has, through little more than word of mouth, become as much a holiday tradition as any of the yuletide season’s more recognizable icons. Like the tours of the past several years, this season’s holiday run will open with the Christmas Eve And Other Stories rock opera performed in its entirety, complete with a 15-piece band in each city, as well as a local string section to help perform the epic symphony. The set will then highlight selections from the other albums in TSO’s recently-completed Christmas trilogy, The Christmas Attic (1998) and The Lost Christmas Eve (2004). Also represented will be material from TSO’s first non-Christmas album, Beethoven’s Last Night (2000). Meanwhile, O’Neill is already knee-deep in the material for Night Castle, which should begin recording in 2006. With a professional resume that began as the guitarist in touring casts of Jesus Christ Superstar and Hair, it was production that best suited the New York City native, who was integral in the success of heavy metal act Savatage, writing and co-writing much of their material. One of those songs was the instrumental “Sarajevo 12-24,” which appeared on the band’s Dead Winter Dead rock opera, and later became the inspiration, and core, of TSO’s debut. Yet, in Paul O’Neill’s magical way, he has spun those stories to be larger than life, and larger than any one of us, spinning an epic so magical it glistens with the spirit of the holiday season, challenging listeners to carry that seasonal joy into the new year, and beyond. Paul O’Neill has built a castle. And like all great castles, TSO is build to last. 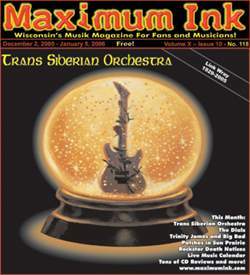 Trans-Siberian Orchestra perform Dec. 26 at the Resch Center in Green Bay (two shows, 3pm and 8pm), Dec. 28 at the Alliant Energy Center in Madison (two shows, 3pm and 8pm), and Dec. 29 at the Bradley Center in Milwaukee (7:30pm).